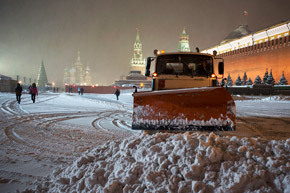 A bulldozer removes snow in Red Square in Moscow, Russia, early Thursday, Nov. 29, 2012. A snowfall hit Moscow on Wednesday with temperatures falling to about 0 degrees Centigrade (32 degrees Fahrenheit). Source: AP.